I am truly honored to post this very first interview for Twang Nation with the Texas singing/songwriter, original outlaw and old friend of my dad, the legendary Billy Joe Shaver. I talked to Billy Joe while he was on his tour bus headed to “Sante Fe, New Mexico” supporting his latest release Everybody’s Brother.A special thanks to Cary Baker at Conqueroo for setting the interview up. 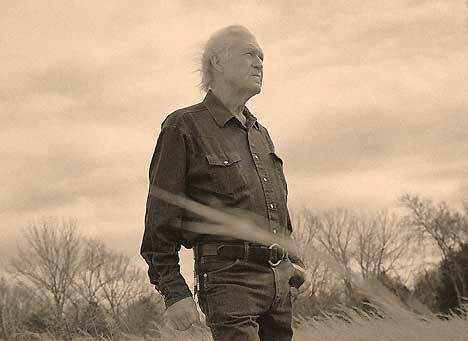 Billy Joe Shaver – Hello? This is Billy Joe calling. Twang Nation – Thanks for calling, sir! Where you calling from? I’m on a bus traveling from a show in Lubbock to a show in Sante Fe, New Mexico. If I lose you man I’m out here on the road, I don’t know what it is with these phones these days. Understood. Then let’s get going, first off how’s your health? I’m doing really well, in spite of it all. I’m enjoying my new-found popularity than I have before. Lot’s of kids are starting to find out about me and lots of kids are coming my shows and bringing friends. Yeah, well I think that there is a market for authenticity in country music that crosses generations. Oh yes, well I think the work we did did in Nashville laid a foundation for that to happen. I think right now we are laying down a even stronger foundation for country music for the future. And you have a new generation or musicians that have taken the torch you helped pass, Dale Watson, Hank Williams III and Shooter Jennings. Yeah, I love Dale. Shooters great, Shooter, Hank III, they’re all great. You mentioned your new-found popularity, now in the last in the last decade you’ve appeared in movies (With Robert Duvall in The Apostle (1996) and Secondhand Lions (2003), The Wendell Baker Story (2005), and in a documentary of his life, A Portrait of Billy Joe (2004) directed by Luciana Pedraza.) you played at the Grand ‘Ol Opry (1999), performed on Country Music Television’s “Outlaws” (2005) inducted into the Nashville Songwriters Hall of Fame (2004) and the the Texas Country Music Hall of Fame (2006) as well as making your mark in contemporary pop-culture by singing the theme songs for the Television show Squidbillies (Adult Swim) so you’re finally coming into your own it seems. Yeah, it’s funny, it might just be sympathy. I’ve been hanging around for so long (laughs). I’m 68 now but I feel better than I ever have because back when Jerry Max (my dad) and I were hanging around we was hitting everything thing in the world, man. After a while I kind of unloaded the wagon a little bit and I don’t do those things I used to do and I feel much better now. With all this clean living you must now be being rewarded. (Laughs) I hope my past sins don’t catch up with me, but that’s what Jesus is for. Would you say back then you had to live in the dark to now the light? Yeah, that’s right..that’s a great way to put it. In your song “I Been to Georgia on a Fast Train” you sing that “my grandma’s old-age pension is the reason that I’m standing here today,” how else did your grandma influence your life? Well after by Father left us (Shaver’s father, Virgil, abandoned the family before he was born) and then my Mother got sick and they didn’t know if she was going to make it. Of course I’m inside of her, but she pulled through and she said “If this baby is a boy I’m gone.” and sure enough got a chance to work in the honky-tonks in Waco so my grandmother raised me until I was twelve-years-old. She was a real sharp lady, an Irish woman Collins was her name, and she got the job done. Did you have any formal music lessons growing up? You recorded “White Freight Liner Blues” which was a Townes Van Zandt song, did you know him? Oh yeah, Townes was a real good friend of mine. I met him in the early 60’s in Houston at this old place called the Old Quarter. Back then I could stay up with him so I figured I must be pretty good, but my wife just really hated him. She’s gone on to Jesus now, but when I used to get into trouble with Townes I would lay a lot of blame on him and she would have to come pick us up a lot. She didn’t like him at all. Back when she was dying of cancer they told me she had about a week to go and I told her, “I had a dream that Townes was up in heaven, and he was going to be greeting you when you get there.” and she said “Got-dang it now I got to live.” and She lived another year! (laughs) Yeah she used to say somebody could make a lot of money selling razor blades at the front door of one of his (Townes) shows. But I loved him, I thought he was the greatest thing since sliced bread, really. He was hard to keep up with. Yeah, I hung with him a lot. We played a lot of places together. He was out there, but so was I, but I think he was out a little further than I was I believe. Yeah it did, yeah it did and I’m sorry it happened because everybody loved him so much. I guess he died right on time. They used to say that he was unmanageable. They used to say that about me. But now Mathew Knowles (head of Compadre Records and father of Beyoncé) is managing me now and things are going real good for me. I’ve stuck with that little label for some time now and now things seem to be rolling along. So will we see Beyoncé on your next album? (Laughs) I don’t know about that but it wouldn’t hurt! She’s quite a talent, and beautiful too. You paid your dues and went through a lot and came out pretty good on the other end. Yeah, I was lucky. I always had Jesus in my heart all the way and I got born again when I wrote “I’m Just An Old Lump Of Coal” now I’m wondering if a born-again Christian needs to be born-again-again! (laughs) It took me a time of two for it to stick but now I’m in good shape. You think you’ll ever quit your day job and become a full-time actor? No man, I did a little of it, but I really admire actors they really have to be on the ball. I did a little bit of it myself in “The Apostle” with Robert Duvall, I played his best friend Joe in that, and then “The Wendell Baker Story” and “Secondhand Lions” but if you blink you’ll miss me in that one. With 3:10 to Yuma and Duvall’s success with “Broken Trail” it looks like Westerns are making a resurgence. He’s (Duvall) at the top of the list on those (westerns) ’cause he know ’em inside out. I think for a while he was raised on his Uncle’s farm or ranch down here in Texas, that’s the reason he’s got down that Texas drawl and all that stuff. It’s kind of amazing really cause I think he was an Army brat and lived all over but he was down there at his Uncle’s working with horses. I know Tommy Lee Jones has a ranch in his birthplace in San Saba, Texas and does some work with horses. Yeah man, he does it to play polo. That’s what I heard. Seems kind of hot to play polo. I’ll tell you what that’s a hard thing to do but he’s quite a horseman, I’ve seen him play. I like Tommy, I really think the world of him. How was it to be in Nashville when Waylon and Willie started to shake things up and what part did you play? Then Waylon comes down with one of these bikers, and he says to me “What do you want hoss?” and I said “Waylon, you better listen to one of my songs or else.” and the biker starts coming towards me but he stopped him. Well, he took me into the studio and Waylon said “You start playing and if I say that’s it, you leave and that’s it and we never see each other again and that’s the end of it.”Well I played “Ain’t No God in Mexico” and “Old Five and Dimers Like Me” and by the time I got to “Honky Tonk Heroes” he slapped his leg and started getting things together. He got his own band in there and he really stuck his neck out for me. These were the right songs for him because they were too big for me and he could sing circles around me and these song were so huge they needed someone like him to sing them. Well Chet Atkins (then vice president of RCA) screamed bloody murder and said it wouldn’t work but we stuck it out. I had been in Nashville since ’66 so I think I have paid my dues. At first the (music) community didn’t want me in their circle but I got accepted after a while and everybody started to write (songs) that way, it’s kind of raw and it changed everything around. You had to have a tie to go to a lot of places in Nashville back then and we were more like rock and roll. We laid down a foundation and changed things for the better I think. Nashville fought it all the way, they thought it was going to hurt them but it helped them. Before you guys shook things up Atkins and the other label heads would wheel in the strings and the Jordanaires and that was just the way it was, like it or not. Yeah, that was about it, yeah. they’d say “You don’t know how to do this part of it.” but we did and it worked out. Seems they were embarrassed about their history. the hillbilly roots of country was shaming them. Well, I don’t know about that. One of your breed was a Rhodes Scholar (Kris Kristofferson) and he ain’t chopped liver! was “Good Christian Soldier” (written by Shaverand Bobby Bare) on that album “The Silver Tongued Devil and I.” His family tried to disown him because he was suppose to go to West Point but instead he went to Nashville and was a bartender and a janitor and stuff, and he cut that Silver Tongued Devil album and we all knew it was going to be a big hit. Well, he put my song on there and had to borrow some money to get the record done ’cause he wasn’t getting any from his family. Well it takes about a year for the money to get to you, but then after his first hit he took his own money and produced my first album (1973’s Old Five And Dimers Like Me.) That’s the kind of guy he is, he’s just the best songwriter anywhere I don’t see how anybody could be better than him. I love to see him perform live, it’s like going to see a preacher or something, man. It seems to me that you, Kris, Willie, Waylon and Johnny (Cash), you all had each others back when the chips were down with the Nashville status quo, were you all aware at that time the impact you were having? Not really, we never really felt like outlaws, more like outcasts. Nobody wanted to let us in and we had to bust in. There seems to be a lot of new artists coming up and paying homage to the work you guys did. Oh yeah, they’re doing my songs these young kids. Like Jackson Taylor and Todd Snyder and ..gosh..there’s so many of them that are just dangerously good. Now let’s spend a little time on your new release, it’s called “Everybody’s Brother,” it’s a gospel album but it’s not a typical gospel album. Yeah it’s got a honky-tonk feel to it because that’s what I play and I don’t offend anybody with the songs I play on there, as a matter of fact I get bikers and lots of people getting saved come to my shows and crying with me….and it’s a good thing! We’re all sinners and we all need help. How was it working with John Carter Cash (son of Johnny and June and producer of “Everybody’s Brother”)? Man that was like a dream cause I’ve known him since he was eight and he’s just a big wonderful person. He’s really easy to work with and he gets so much done so quickly. It’s kind of miraculous the way he does it. He had so much time watching his daddy in the business. My wife worked for 14 years as a hair-stylist for Cash, we’re all part of the family really. We talked a little but about song you’ve covered, any other favorites? I covered a Mere Haggard song called “Ramblin’ Fever” and I still think that that might be the best opening line I ever heard, it’s ” My hat don’t hang on the same nail too long” (laughs) man that knocked me flat! He’s a great one I tell you. Okay, just to wrap up, I wanted to ask you about the Papa Joe’s Texas Saloon incident. Yeah that was just an unfortunate incident. Anybody else would have done the same thing I did, this guy (Billy Bryant Coker) was a real big bully and he pulled a knife and cut my arm and I let it go at first but then he insulted me so bad we just had to go outside and one thing led to another and , he already had a gun, and I had time to go out to my car and get one. He took so long to aim his little ‘ol 22 and I got lucky and hit him in the face and he dropped everything and then he said he was sorry! I bet he was. Thanks for your time. Great interview! Good job, and thanks. Thanks Linda. It was a privilege, it really was. Good job on the interview, Baron. I didn’t know the tidbit about Kris Kristofferson producing his first album, which is pretty cool. I’ve posted the link here on a few sites, and folks have thanked me for sending them here. It is such a good interview. You should be proud of yourself. I appreciate that Linda. It was an honor to talk to the man. To learn he used to hang out with my dad back in the 70’s was a bonus! What an awesome interview. Great lesson in country music history. Thanks for reposting this on Twitter. Great interview. Saw Billy Joe a couple of years ago in Mineesota. Love the guy. Well done. Thanks for reading Time, and following on Twitter!